Geiranger is a small tourist village in Sunnmøre region of Møre og Romsdal county in the western part of Norway. It's located in Stranda Municipality at the head of the Geirangerfjorden, which is a branch of the large Storfjorden. The nearest city is Ålesund. Geiranger is home to some of the most spectacular scenery in the world, and has been named the best travel destination in Scandinavia by Lonely Planet. 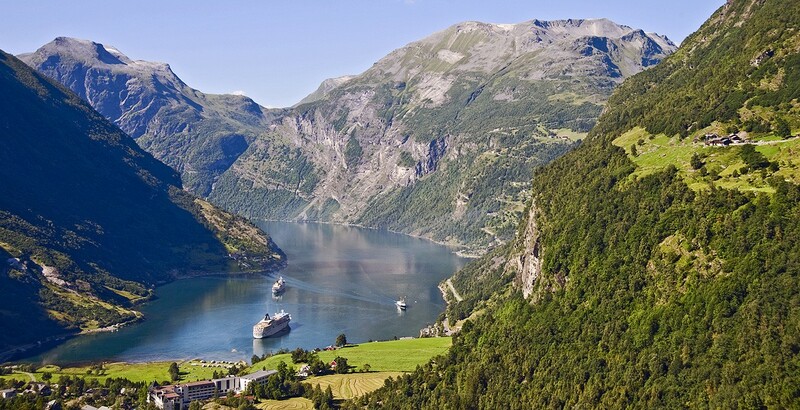 Since 2005, the Geirangerfjord area has been listed as a UNESCO World Heritage Site. The Seven Sisters waterfall is located just west of Geiranger. Geiranger Church is the main church for the village and surrounding area. It was build in 1842, and is located beside the farm Maråk. Besides the farm Vinje is a tumulus from the Viking era. The northbound Hurtigruten takes a detour to Geiranger in the summer. There are several campsites, cottages and hotels in Geiranger. Including Hotel Geiranger and Hotel Union. Hotel Union is the only hotel that has almost all year, with only closed the first two weeks in January. The road to the top of Dalsnibba (Nibbevegen) was established (in 1939) only for the tourists after the motor vehicle made the long climb from the bay manageable. Ørnevegen between Geiranger and Eidsdal was completed first in 1956, making it before the time was little through traffic with vehicles. Before the car's time was the villagers engaged in staging sing of tourists with horse and carriage along Geirangervegen. Later it was invested in vehicles that withstood the steep slopes and hairpin bends. In the 1930s there were up to 50 open shuttle cars in the village, and Geiranger at that time had a larger car density than Oslo. During the war seized the occupying 37 shuttle vehicles, immediately after the war were only 9 cars in business. In 1938, the rate for skys singles by car to Djupvasshytta 45 NOK, which corresponds to 30 to 45 hours' salary for a construction worker. Trollstigen opened in 1936 and Ørnevegen in 1956, leaving the continuous road (interrupted only by a short ferry to Eidsdal) from Åndalsnes (Rauma Man terminus) to Grotli. During the summer, a ferry shuttles between Geiranger and Hellesylt. In 2010 traveled an average of 140 vehicles and 690 people daily by ferry. Kaiser Wilhelm II of Germany visited Geiranger by ship in 1899 which were good advertisement for the village. The emperor then visited Geiranger each summer until 1914. Geiranger has annually visited by 150–200 port calls by cruise ships, making the village to the second largest cruise port (only Bergen is greater).